In addition to providing fundamental information about how remote sensing, photogrammetry, and GIS work together, Konecny outlines the history of their development. He discusses the theoretical principles that underpin them. He furnishes extensive examples of how applications using remote sensing, photogrammetry, and GIS increase understanding of the world and improve decision making. With nearly 70 years of experience in the field, Konecny is uniquely qualified to write this book. In 1945, he began working in surveying, photogrammetry, and mapping and is one of the leading authorities in the field of geoinformation. He is emeritus professor at Leibniz University of Hannover in Germany and the former president of the International Society of Photogrammetry and Remote Sensing. He holds honorary doctor of science degrees from the University of Tucman, Argentina; the University of New Brunswick, Canada; Anna University in Chennel, India; and MIIGAiK, Moscow, Russian Federation, as well as numerous awards and distinctions from universities and professional organizations around the world. 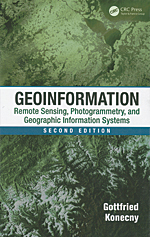 The second edition was updated to reflect technology advances in remote sensing, photogrammetry, and GIS that have occurred in the intervening 12 years since the publication of the first edition. The examples of the use of remote sensing in the study of meteorology and climatology, oceanography, environment, nonrenewable and renewable resources, and natural hazards are new with this edition. The GIS section has been greatly expanded also.